The public demanded more transparency on how ads are being targeted to them, and what companies are running ads on the platform. Facebook has made strides in increasing overall transparency with its ad business over the past year. This week, yet another development was made to aid this mission – the Facebook Ads Library. “The Ad Library provides advertising transparency by offering a comprehensive, searchable collection of all ads currently running from across Facebook Products. Anyone can explore the Library, with or without a Facebook account. How Does the Ads Library Work? 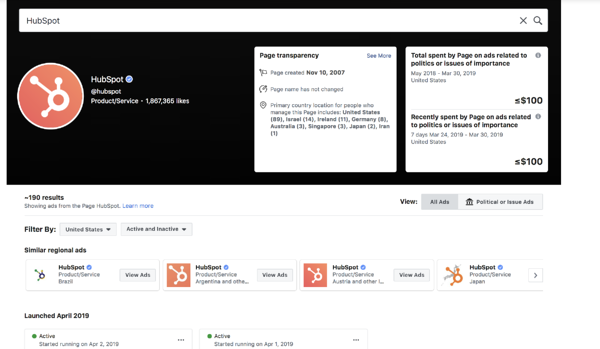 The Ads Library builds off of Facebook’s Ad Archive that was launched in 2018 – where users can see all active or inactive ads related to politics or other policy issues from May 2018 to the present. Now, the Ads Library has expanded this functionality, allowing you to view all active ads about any topic, even if the ad isn’t targeted to you. However, there are a few important factors of which to make note. First, the “Search” feature is only for political or issues ads. Other ads can still be viewed by searching the company page, but can not be found using keywords. For example, you can search “Climate Change” and see all related ads running, as well as existing pages using the topic, as seen in the screenshot below. Many speculate that Facebook chose to limit this for non-political ads due to push back from advertisers fearing that competitors would use it to evaluate the ad strategies they’ve used in the past. Additionally, Facebook’s Ads Library also provides detailed information on the pages running the ads to help you understand who exactly is behind the advertising. Regardless of whether the advertiser is running political or non-political ads, Facebook will now show you detailed insights in a new “Page Transparency” Tab. In addition to being able to view all ads the page is currently running, users can also report an ad for policy violations from directly within the library. This feature will enable users to help Facebook identify pages using questionable tactics to try and spread misinformation or that have other ill intentions. Having a history of name changes, mergers, or political ad history can help users easily spot ad accounts that have the potential to do harm. It’s great that anyone can create an ad account and market their business on Facebook – however, any technology with these capabilities has the potential to attract those that aren’t necessarily well-intentioned. Facebook’s efforts to improve transparency around not only sensitive topics but its entire library of running ads creates accountability for both the platform and its advertisers.